My backyard is crap right now. Three thing have led to my lawns decay. I took shortcuts. I should have brought in more topsoil and done some grading so it drains away from the house better. Clyde. The #1 and #2 didn't kill it, the running full speed and slamming on the brakes did. Shade. See the shadow from those trees? They are now taller and fuller. There are probably more blades of grass in a square foot of that picture than there are on the whole lawn now, it is that bad. The moss does well, though it is even more susceptible to #2. Done right moss is very pretty, you just cant play on it. Being a glass full kinda guy, I have decided to make lemonade out of lemons. 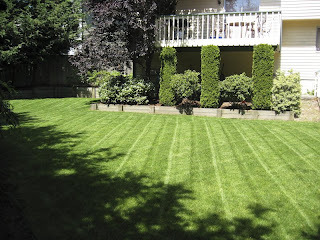 I am going to do some trimming to control the trees more, but am leery of spending the money right now to do my lawn right. 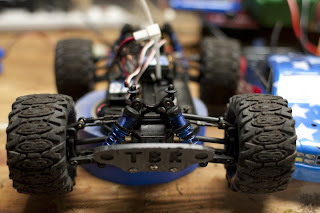 So, I broke out the RC car! When the lawn was healthy, I couldn't drive the car in the back. It is a 1/18th scale car (small) and the grass blades would float it. It would move, but slowly. No fun at all. It hauls donkey in the street in front of the house, but there is the whole 37 year old without kids playing with toys thing. People just don't understand. Now with the lack of lawn, the car hauls! I go out back with Clyde and we take turns. Me chasing him with the car, him chasing the car. It is an absolute blast! Often while he's chasing the car, I'll spin the thing around causing him to launch into the air to avoid it. He is quite agile for a hundred pound dog. Occasionally he comes down on top of the thing. The car is fairly tough but things break. Today it was the drivers side upper turnbuckle. If you look closely at the picture below, you can see that I replaced it with the old plastic one that I had held on to. I replaced it, threw in a fresh battery, gave the car a once over, and was back out racing with him ten minutes later. I enjoy the fixing of the thing as much as the driving. It's like... second fun. Here is the thing after a hard evening of bashing. The dog is asleep as I type.